When you're in the market for a new piano, knowing the best brands to look for can make your buying process much easier. With high-quality piano brands, you know you're getting a piano that is made with care and diligence to the high standards that only the most reputable piano manufacturers maintain. With hundreds of piano brands to choose from, it's important to read on and do your research. Steinway & Sons have been in the piano manufacturing business for over 160 years. The company is dedicated to providing precision pianos that meet the needs of professional performers. The most popular model is the Steinway D, which is arguably the best piano in the world. Other notable options include the Boston Performance Edition and the Essex studio upright piano. The Boston Performance Edition piano is suitable for students. The Essex upright is perfect for the piano teacher or pianist who has limited space. Since the Steinway D runs from $30,000 to $100,000 dollars, it's one piano you'll want to purchase from an authorized retailer. The Essex is the only option that is recommended for purchase online. Baldwin is one of the larger piano manufacturers in the United States. The company was founded in 1862 in Cincinnati. These pianos are generally more affordable than a Steinway, and they offer good reliability and tone production. You can purchase vertical piano starting at $8,500. A grand piano is going to run you at least $22,000. While you can order these pianos used from some major piano restorers online, it's best to visit your local piano store to get the piano. This way, you can check out the piano in person before taking it home. Due to its price, you'll want to purchase from an authorized retailer as well. This is probably the most easily recognizable piano brands, but they are not the best. When it comes to piano manufacturers it ranks in the top 10. Depending on who you talk to, Yamaha may even come in as number two. The best value for someone on a budget is the Yamaha YDP series. If you want a baby grand, the CX series is likely to provide you with the most affordable option. Like most pianos, you're going to have to visit a store to get a Yamaha piano. Although, it's sometimes possible to find pianos for sale at major retailers. Since the cost of shipping a piano is so high, an online piano is going to be an unusual find. You're best off to do some searching online before making a trip to your local piano dealer for your purchase. Kawai makes sleek-looking and sophisticated pianos. They have been trailing Yamaha when it comes to the best piano brands on the market in the early 2000. Kawai has been making further improvements on their piano since 2008 and many piano retailers favors Kawai over Yamaha due to its sound quality. However, they have unique designs that should appeal to the up and coming professional or hobbyist. The tone production of these pianos is high-quality, and you'll enjoy the ability to get some of the best piano technology at a low entry price. The most well known Kawaii digital piano are the CE220 series. They cost more than a regular Yamaha brand but the touch of the piano button and the quality of the sound output are way over magnificent. These pianos are significantly less than the top piano brands, but you'll still get a quality piano you can enjoy at home. Suzuki are not just well known for its music learning books, but they also offers some high-quality piano options that are geared to the entry-level professional and savvy consumer. The manufacturer is the leading manufacturer for education, and it's designed to have a long-lasting design that can stand a bit of abuse. These pianos don't generally increase in value, but you won't regret getting a Suzuki piano. The company makes 14 models, and the choice is largely going to be based on your budget and needs. You'll enjoy an exceptional playing experience, full sound and exceptional value. The company also offers a range of traditional and modern piano cabinet designs. It's also one of the few manufacturers that offers a digital piano in a baby grand form. Bösendorfer was founded in 1828 in Austria. Bösendorfer mostly makes grand pianos. Their Imperial Grand is one of the largest pianos in the world. A distinctive feature of Bösendorfer pianos is that a few of their models have extra keys. Their Grand Piano 225 has 92 keys and the Imperial Grand has 97. Due to how slowly the strings vibrate on the lower notes, it is possible to hear each individual beat of the vibration. It is nearly impossible to tune the extra strings by ear, but those notes are hardly ever used. The keys are more “delicate” than others. The Bösendorfer sound is more suited for classical, but that doesn’t mean it can’t do it all. Hailing from eastern Germany, Blüthner has been owned by the Blüthner family since 1853. They come in various styles and finishes and two special editions: A 150th Anniversary edition and a Julius Blüthner edition. The aliquot strings in the highest treble section have four strings instead of the typical three. The fourth string is just above the other to vibrate sympathetically. It creates an effect similar to a duplex scale. They also have angled hammers which are designed to evenly distribute the force on the strings and the hammers. A first by Blüthner is the their piano specifically for left-handed individuals. The keys are set up backwards. Blüthner has a sound that can be described as warm and romantic. Founded in 1853, Bechstein quickly became one of the most popular piano manufacturers in all of Europe. By 1900, they were making over 5,000 pianos a year. All Bechstein pianos are built in Seifhennersdorf, Germany, but some of the components come from outside of Europe. Bechstein refuses to say where some of their parts come from. Despite this, they still uphold the rigorous standard and continue to uphold their sound and quality. The pianos come in two series: Bechstein and C. Bechstein. While both are excellent, the C. Bechstein series comes with a higher quality and, of course, a higher price. The B series Bechstein are built in a more efficient manner with less complexities. Fazioli was founded in 1981 in Italy. They current have six models of grand pianos available. A notable quality of one of their grands, the F308, is that it is the longest piano available on the market today. Another unique aspect of the F308 is the inclusion of a fourth pedal. It works like a soft pedal on an upright piano bringing the hammers closer to the strings. Fazioli pianos have a unique feel to them. If you play them like you would a Steinway, it would not sound as good. They have incredible potency and project their sound well. Shigeru Kawai is the 2nd largest piano manufacturer in Japan and is well known for its quality and innovation. A majority of their grands and uprights are made in Japan, but their smaller pianos are made in Indonesia. Kawai pianos do not use all wooden components. They use ABS Styran plastic for their action parts. The plastic doesn’t swell or shrink with changes in the environment, so they require much less maintenance than your typical piano. Without wood glue, breakage is also rarer. Some of their pianos are reinforced with carbon fiber. This adds an additional layer of protection from rough play. Mason & Hamlin is an American company. In 1881, they began to make pianos and became known as Steinway’s chief competitor. Today, Mason & Hamlin now owned by the Burgetts. They make the older designs from Mason & Hamlin’s Boston era, but they have refinements to improve them. They created new rim presses and modernized specific features. Their model 50 vertical piano has been designed with longer keys to make it feel more like a grand piano and has better pedal leverage. Their American tone can be described as lush and powerful. They have a clear treble and a powerful bass. Their sound remains consistent throughout all of their pianos. An Australian based company, Stuart & Sons have a variety of unique pianos. One of their grand pianos has 14 extra keys making a total of 102 keys. They also have a model planned that will have 20 extra keys for a total of 108. Most of their pianos come with 4 pedals: 2 soft pedals and 2 sustain pedals. Each of them produce different effects. 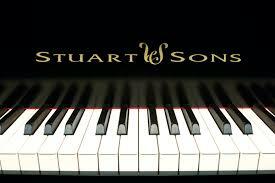 The sound that comes with Stuart and Sons is comparable to that of a Bösendorfer. It produces a warm and sweet tone. They do, however, tend to be on the more expensive side. Schimmel was founded in 1885 and is located in Braunschweig, Germany. In 2016, another group bought most of their company shares. They have a wide variety of pianos available. Their latest Konzert grands bare the “Made in Germany” certification and are of a higher-quality construction. The sound Schimmel pianos make is clear and transparent. They are well suited for classical and baroque style music. Their smaller models can have a brighter tone than the larger models. Their Classic C169T is regarded as one of the best pianos in the world. Schimmel claims it’s not possible to produce a higher-quality model. Founded in 1835, Grotrian Steinweg is a family owned German company. Their Cabinet Grand, the smallest grand they make, really shows the quality of Grotrian pianos. It has a very clear tone and projects the sound very well. It does not, however, handle it well if you strike the keys with force. Their largest vertical piano is also excellent. The sound it produces is similar to that of a much larger piano. It does not project as well as grand pianos, but it does project better than most other vertical pianos of its size. Their larger grand produces a clear and elegant sound, but it has a harder time projecting that sound outwards. All Grotrian pianos have a consistent high standard and produce a variety of tones depending on the model. The Walter Piano Company is a family owned American company. Each piano is signed and inspected by a member of the Walter family. They have studio, grand, and vertical model pianos. The vertical models have full-size actions. While mostly made of US and European parts, they offer the option to buy Chinese made actions. They lower the price of the piano, but the action will have a lighter touch. The grand pianos were designed by Del Fandrich. They have high-quality features that help reduce the loss of energy and increase sustain. Walter pianos have good build quality and beautiful tones. Purchasing a piano is a big decision, so it's important you understand a bit about how pianos work. There are two main categories of pianos to choose from. Depending on your needs, one style may be more useful to you than the other. These pianos are generally the least expensive. They also take up the least amount of room. If you don't plan to be a concert pianist or if you just want to play for fun and are on a limited budget, an upright piano makes the most sense. They don't produce the same full sound as a grand piano. However, honkytonk and other popular styles of music may require the sound of an upright. Generally speaking, the other type of piano is the grand piano. There are baby grand pianos and concert grand pianos available. These pianos are usually out of the range of the hobbyists budget, but for the professional pianist who records their own music, this piano is an ideal option. These pianos give a big full sound, and you just need to decide what length is right for you. The process of manufacturing a piano is not something to take lightly. There really aren't many grand pianos from generic brands. The process to create a grand piano is extensive and the strings end up placing literal tons of pressure on the frame of the piano. Each string creates a tension of 160 to 200 pounds, and the entire piano has a combined stress of over 35,000 pounds. With that much tension, it's important manufacturers take special care to create quality instruments. This is why it's more difficult to find cheap grand pianos because they are expensive to manufacture. There are a few criteria that you need to consider when you're in the market for a piano. The first thing to realize is that a piano must have a full-size 88-key keyboard to be able to play the standard literature. If you've got money to burn, you can always look for a Boesendorfer piano that has an extended low range, but this is only needed for the true professional who needs to play often in the basement. When buying new, you don't have much to worry about if you choose a good quality brand. However, buying a used piano requires more care. Check the strings for corrosion and look for any deterioration in the structure. It's best to hire a piano tuner to come along with you if you plan to buy a used piano. Speaking of piano tuners, you're going to need a good one. No matter how high-quality the brand of the piano, it's going to go out of tune. Piano wire rarely needs to be replaced, but it can create a dangerous situation if old wire isn't replaced in time. A piano tuner will help keep your piano in top shape and can prolong the life of your investment. To be sure, when you purchase a quality piano, it is an investment that may increase its value with age. The piano tuner will keep your piano in good working order. You should plan to get your piano tuned about four times per year and whenever you move the piano. If you need to move any piano, it's important to hire specialized piano movers. A piano is a high-precision instrument. Moving a piano is not as simple as picking it up and putting it in a new location. Some musicians say you don't need a very good piano. That as long as you have something to practice on, that's all that matters. They argue that if you are a pianist, you're not going to take the piano with you. This means that you can get away with buying a cheap piano for home since you'll always use a concert hall's piano in a performance. This is mostly true, but you will get used to a substandard playing technique if you play on a substandard piano. Some old pianos simply can't be tuned properly since the underlying structure simply won't be able to handle the stress from the tension of the strings. Playing on a piano that isn't tuned properly and doesn't function well accustoms you to a certain way of playing. When you get your hands on a quality piano, it just won't feel right in a performance. There are a few things you should consider when buying a piano. If you're getting your piano online, then you should only purchase your piano in new condition. This will eliminate many of the potential problems associated with buying a piano used. It's also important you go with a quality music store. Avoid purchasing your piano from a retailer that doesn't have specific experience dealing with pianos. Humidity levels and temperature can negatively affect a piano. It's important you buy from a retailer with an understanding of proper piano care. It's time to get honest about the selection of a piano. If you're not a professional pianist who has tens of thousands of dollars to spare, it's best to not seek out an acoustic piano. A vertical piano from one of the lower-quality piano brands won't serve your purposes well. On the other hand, an expensive brand from one of the best piano brands will set you back significantly. If you are not sure whether you should get a piano, you can start out by trying virtual piano games we recommend. If you're a professional, call up your local Steinway or Baldwin dealer to get a piano today. For everyone else, the best option is to get a digital piano with velocity sensitive keys. For this reason, the Suzuki MDG-300 Black Micro Grand Digital Piano is our recommended choice. This piano replicates the feel and experience of playing a full-sized instrument, but it offers a substantial discount in savings and it can do things a regular piano can't. It uses a 6-way stereo speaker setup to replicate the sound of a real baby grand, and you'll love how it looks in your home. Overall, the Suzuki piano offers the best value and functionality for the price. The ability to choose a specific style and design makes this an ideal choice for the pianist who just wants a quality instrument to play on. Why the best piano maker in the world is not listed? Have you never tried out a concert grand BORGATO L282 or a BORGATO GRAND PRIX 333? BORGATO is actually pretty high end that neither me nor my friends played before! I will do some research on this and put it in the above article! Hello, may I use the piano brands article on my website? It would be great information for my customers that are looking at new or used pianos. As a piano technician I would like to help them find the best piano for their needs. Thank you. Feel free to refer your user to this resource! What you wrote about Yamaha and Kawai and others is way off. Yamaha is like Toyota and that includes Lexus. The CX line is the conservatory line and is a moderately expensive to expensive line. It goes from a 5 foot 3 model to a 7 foot 6 inch model. The lesser expensive Yamaha grands are the GC and GB1K. Yamaha makes some of the best pianos and they last. I don’t think they are any lesser a piano than Steinway and Sons when you get to the CF handbuilt series. And the Shigeru Kawai is not good for Classical? Huh? Are you aware of all the International Competitions where Shigeru Kawai’s SK-EX is one of the pianos onstage for contestants to choose? And Shigeru Kawai, the Lexus of the Kawai divisions, are hand-built in Japan. All are made there. You’re mistaking Shigeru Kawai from K Kawai. Some K Kawais aren’t built in Japan, but that’s different than Shigeru Kawai. Hi Ben, this is an article about piano brand, not about specific lines or models of the brand. That being said, I will consider writing articles on specific brand that covers different product models. Guys come on if you do not put Steingraeber this list looses credibility. With Fazioli and Bosendorfer they are the best. A classic brand! thanks for mentioning it. Will add it above once I have the description written up! Just the other day, I played a $125,000 Bluthner at a retailer in Clearwater, FL. They are readily available from the retailer that also supplies Rodgers church organs. They’ve been in business for 60 years. The Bluthners are awe-inspiring, to say the least. I would imagine judging pianos by sound would depend on the size and type as well as the room of audition. The one I played was surrounded by numerous other pianos and church organs in the same carpeted room. That being said, this article is very much appreciated. Thank you very much for this most interesting look at the various brands available. I would be happy with any of the higher quality models. is there a brand of piano that goes by the name “Same”? We do not know there is a Same brand piano. Hello I have a BLESSING piano but no nothing about them, are they any good? I have never heard of a piano brand named BLESSING. You may have a rare item at your place! Hello…wondering if you have ever played a Petrof piano? I have a baby grand and it has a sweet sound, especially in the treble and my tuner says it is a very high quality instrument. I have had it about 22 years, bought it new. Hi Fancy, I’ve never played a Petrof piano! thanks for sharing your experience with us! Many thanks for your valuable article, Stephanie, on piano brands. My question is basically whether any of the better make of upright pianos (called “vertical” in the USA I believe) are as good as a reputable grand piano in terms of tone and (especially) touch? The upright pianos I would consider are Schimmel or Grotwen-Steinweg or, I guess, a Bechstein or Bluthner. Or, do you think, has someone of my level of playing ‘outgrown’ an upright piano? I’m at diploma standard. At the moment I have a Welmar upright, and although the tone is very nice and mellow the touch is limited when playing more difficult pieces in the repertoire. I have just about enough space for a grand of up to 6 foot. I live in the UK. My budget is limited too, but should be able to stretch to quite a few thousand pounds. Hi David, it really depends on the condition of the piano. However to provide a quick answer I’ll say no. Especially based on your budget. Just because the tone and the touch can “fade away” (things not working) for some upright pianos. I can’t speak for all, just based on personal experience. She plays well but like most I suppose has to be reminded. Would the Blüthner be worth the investment. Yes with that price a Bluthner is definitely an excellent investment!